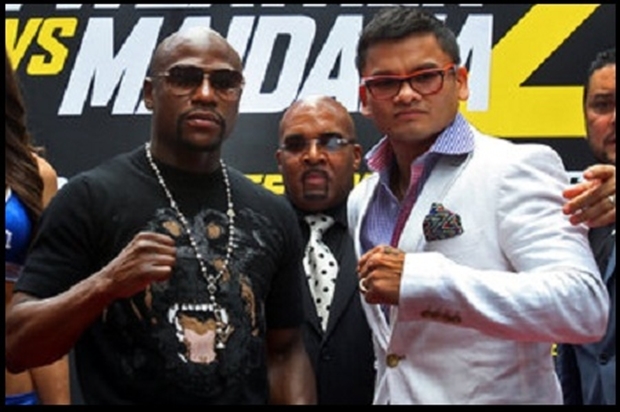 In their first fight, a jaded, disinterested Mayweather held his own against a supremely motivated and sharp Maidana. Then, at the mid-rounds mark, he stepped on the gas ever so slightly and cruised to a near shutout in the second half of the fight. We’ve already seen that Maidana at 100% couldn’t beat a daydreaming Mayweather, it’s doubtful that we’ll see a better Maidana or a worse Mayweather in part two. 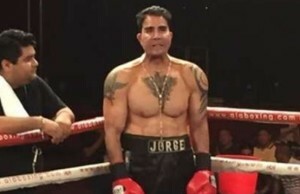 The only intrigue in this bout– other than Maidana’s one-punch power, which is always a factor– is whether the political battles behind the scenes with Golden Boy and the growing public scorn outside the arena put Mayweather in a situation where he’s not going to get the benefit of the doubt in officiating or judging anymore. 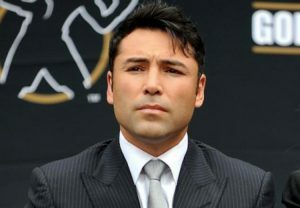 Even so, a more focused, sharper Mayweather should win easily, probably via unanimous decision. I see Mayweather winning this one in convincing fashion. Maidana’s strong and aggressive, and this style suited him well in their first contest but he only fights one way: straight forward. To state the obvious, Floyd is one of the smartest and most versatile fighters you’ll find out there, and he’ll be better prepared for Maidana this time around. That’s not to say that “El Chino” won’t have some fine moments, but I doubt he’ll ever put Floyd at serious risk of losing. Just as he did in his rematch with Jose Luis Castillo in 2002, Mayweather will make the necessary adjustments to better cope with the challenger and win this one by comfortable unanimous decision. In Marcos Maidana’s last two bouts he employed a similar plan of attack of coming forward and throwing punches in awkward angles—mostly a looping overhand right. Yes, he’s had some success with this strategy, but to beat Floyd Mayweather he’ll have to add something in his game plan that’ll throw off maybe the most cerebral boxer that ever lived. Anyone who thinks the May 3 version of Maidana has a shot to win this fight is crazy. If Mayweather figures out fighters, and makes the proper adjustments mid-way through a bout; imagine what he’ll muster up with an entire camp, having already seen what his foe has to offer. Maidana barely used his jab in the first fight, if he finds it, he could give Floyd some trouble, the way Miguel Cotto did. But I don’t see Maidana making those adjustments, or Kenny Bayless allowing all of the rough housing, and for that reason, Mayweather wins in a shut out. In my opinion, Mayweather will try to make this everything but mayhem as he stays off the ropes and does his thing in the middle of the ring. He is up against a mugger who throws all kinds of shots from different directions, but he now knows that and undoubtedly has made the proper adjustments in training. If not, he will be in for a rough night. But in the end, I see him making Chino miss most of his heavy stuff. I also see Chino being countered by inside hooks and uppercuts. And once Floyd reaches cruise control around the ninth or tenth round, his signature potshot leads should begin putting the final touches on slowing down Maidana. 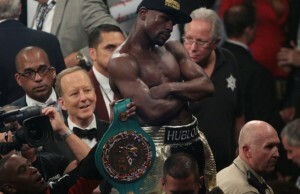 Mayweather wins in a relatively boring 12 UD. This is a crucial fight for Mayweather Jr. Saturday’s rematch will tell us whether the first fight was simply an off night on Mayweather’s part, or a real indication that years are finally starting to catch up with him. Not many people expected Floyd to have so many problems containing Maidana, but the Argentinian’s brute strength, and work rate, gave the champion probably the most uncomfortable fight of his career so far. 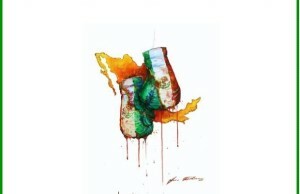 On Saturday Floyd needs to move more, and throw more punches than he did last time. The big question is can he still do that at 37 years of age. I don’t see this fight being so much different from the first fight, Floyd will try and take control earlier, but Maidana will still be all over him and make it tough for him to work. At 37 Floyd no longer has the legs to keep himself a more mobile target as he would have some years ago. 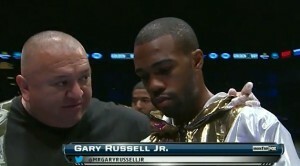 The referee may be as much a key to how this fight goes as the fighters themselves. Look for Maidana to have some points taken away pretty sharply if he tries the roughhousing that he did in the first fight. This will be another close decision win for Floyd, with probably some splashes of controversy thrown in for good measure.